xford in 2060 is a chaotic place. Scores of time-traveling historians are being sent into the past, to destinations including the American Civil War and the attack on the World Trade Center. Michael Davies is prepping to go to Pearl Harbor. Merope Ward is coping with a bunch of bratty 1940 evacuees and trying to talk her thesis adviser, Mr. Dunworthy, into letting her go to VE Day. Polly Churchill’s next assignment will be as a shopgirl in the middle of London’s Blitz. And seventeen-year-old Colin Templer, who has a major crush on Polly, is determined to go to the Crusades so that he can “catch up” to her in age. But now the time-travel lab is suddenly canceling assignments for no apparent reason and switching around everyone’s schedules. And when Michael, Merope, and Polly finally get to World War II, things just get worse. For there they face air raids, blackouts, unexploded bombs, dive-bombing Stukas, rationing, shrapnel, V-1s, and two of the most incorrigible children in all of history—to say nothing of a growing feeling that not only their assignments but the war and history itself are spiraling out of control. Because suddenly the once-reliable mechanisms of time travel are showing significant glitches, and our heroes are beginning to question their most firmly held belief: that no historian can possibly change the past. Stand alone or series: Part of an ongoing series of standalone novels that feature time travelling Historians. How did I get this book: Bought both books. Why did I read this book: Because I have become a HUGE Connie Willis’ fangirl. Note: This is a spoiler-free overview of the two books. 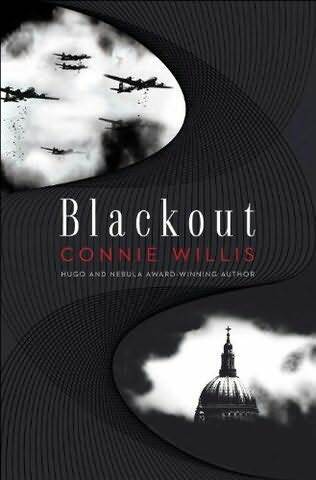 Blackout and All Clear are a two-volume novel published a few months apart in 2010. They are part of an ongoing series of standalone novels that involve time travelling historians who travel back from Oxford University of the mid 21st century to several points in time to observe History as it happens. The series started in 1984 with the novella Fire Watch1 and was followed by Doomsday Book and To Say Nothing of the Dog. It is not essential to have read the previous books since they stand alone really well but unlike their predecessors, Blackout and All Clear mention previous events in the series and even at some point rely on and intersect with those storylines plus two of the main characters from Doomsday Book, Dr. Dunworthy and Colin, have Really Important Roles to play here. I believe those who had read the previous books will inevitably enjoy the experience to a greater extent. The story starts in 2060 as three historians are getting ready to take on their different assignments at different points in the past. All 3 are getting increasingly frustrated as their team leader, Dr Dunworthy keeps changing where and when they are supposed to go, without any advance notice. Their assignments are shifted around and the three end up being sent to different months in 1940: Mike Davis, who is studying Heroes is sent to observe the evacuation of Dunkirk; Merope Ward, the youngest and the most inexperienced of the trio is sent to Warwickshire to observe children evacuated from London; Polly Churchill is to go to London to observe the Blitz and how people in the underground shelters reacted to the Blackout and bombings. An aside: Doomsday Book’s Colin, is 17 now and completely in love with 25 year old Polly and asks her to wait for him to “catch up” which he plans to do by doing assignments that would last years and then going back to the same point where she is. He also promises her that he WILL get her out if something happens to her. This is your first clue that Something Bad Is About To Happen. Parallel to those three storylines, we also get to see a few other historians a few years later, also observing the World War II (the relevance of those parallel stories only becomes clear in the second volume). The clock is now ticking. What is going on? Why are the drops not working? Can they try and find each other in the chaos of World War II? What will happen if they can’t go back to the future? Only one thing becomes more and more clear to the Historians: everything they knew, of thought they knew about time travelling and its laws might be totally and completely WRONG. The point is: the past is not a homogenous block and these books explore those ideas really well. It is easy for example to think about Hitler and Churchill when one thinks about WWII but the war effort went of course, far beyond the roles the two played. As small as their contributions might have been the War is about the soldier in the front lines, the canteen lady in the tube stations shelters, the volunteers of the fire watch. In that sense, the main concern and question that each time traveller in the books have to ask themselves is, since the War Effort was made by some many different lives can ONE person change the course of history? It is an interesting question that keeps popping up in these books and are part of the narrative as well: as with the previous books, the historians have impressive spiralling thought-processes where they examine every single detail of what they do and what it can engender. The point is: their mission is to observe events but they are also observing people, how they deal with the horrible things happening to them, how they survive in face of adversity. It is about love and loss and hope and death. It is about ordinary people – and good people for the most part – doing their small bits to help. This is another incredible, beautiful book by Connie Willis, and you must pardon me for the use of such a clichéd review-word, but it is an incredible tour de force. It is full of interesting facts which are vividly incorporated into the narrative and not to mention the appealing, sympathetic characters that range from the three main characters to the secondary ones (including the two impossible street urchins Alf and Binnie; a Shakespearean actor and even Agatha Christie).And Colin. Ah Colin: the romantic in me cannot repress a sigh of contentment at how fine a young man you turned out to be. 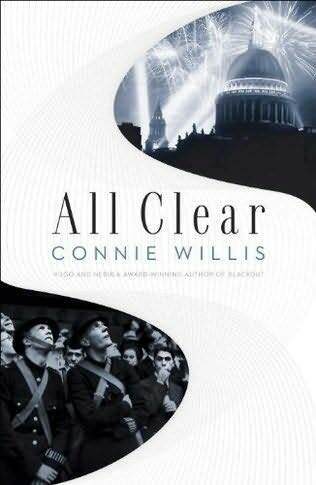 If you already love Connie Willis, I don’t see how you can’t love this book (at least to one extent or another). But do yourself a favour, you must – and I can’t stress this enough – have All Clear on stand-by. You will need it as soon as you finish Blackout. Notable Quotes/ Parts: Oh, I don’t know…everything? Totally agree with your review–I love Connie Willis and these two books were amazing. Oh, I loved these books! And yes, do have All Clear waiting–I didn’t and it was torture! I agree, these books were fantastic. And I highly recommend the audiobooks; the narrator (Katherine Kellgren) is great, especially with the voices of Alf and Binnie. I am in 100% agreement with you that social/cultural history is where it’s at. I had to decide on my major last week, and all of this year I had been agonizing over history vs. anthropology. Finally, I decided on history because while I love learning how and why culture(s) work, I like having historical narratives to go along with them. In terms of the books, if they are what you say they are, in terms of explicating what history actually is when taken out of an academic setting and how you have to relate to that: sign me up. That sounds excellent. I just read Fire Watch and it’s brilliant. I’ve actually had Doomsday Book on my wishlist for ages but haven’t gotten around to reading it yet. Should I read that first, before To Say Nothing of the Dog? @Sakura – Doomsday Book was published first (and it is about the Kivrin mentioned in Fire Watch and her praticum) but I read To Say Nothing of the Dog first and I think that either way is cool. I would perhaps pick them according to your mood: if you want HILARIOUS comedy of manners, go with Dog. If you want HEARTWRENCHING tragedy, go with Doomsday book. Thank you so much for this review and the link to the novella. I discovered my library has all the e-books available for check-out online, and I’ll definitely be moving all of these books way up my to-read list. Loved To Say Nothing of the Dog and can’t wait to get to these two as well. ¿cuanto tendremos que esperar para leerlo en castellano? Spot on review, only one niggle, it is a 10/10 for me. I am guessing the reviewer and the flattering posts all originate outside the UK. Alas, for readers or listeners in the UK, this book is spoilt in two ways: the author’s ignorance of wartime Britain (something which most people in the UK are surprisingly well up on) and the unfortunate choice of narrator. Science fiction writers, since they deal in fantasy, do not usually have to research their subject but if the author had done so she might have avoided the many obvious howlers. A few examples: a character carefully examines an envelope posted in England bearing a “two cents stamp” yet fails to notice anything odd about this; a character reads the latest news from the front page of a wartime Times, a newspaper which is famous for showing only advertisements on the front page; a character reading The Times is desperate to discover the date so she frantically thumbs to the front page, even though The Times, like all UK newspapers, has the date at the top of every page; Londoners are quoted as referring to “the London Times” or “the Times newspaper” when no native would ever call it anything but “The Times”. As to the narrator, while she has a clear, pleasant and expressive voice, she is stymied by the British class system which permeates all depictions of our society, to the great confusion of foreign authors. Her natural voice seems to be upper class and well educated (for example, she pronounces “passengers” as “pahrssengers”) which makes all her lower class characters sound like they are talking in a very affected manner, as if they are all pretending to be posh. I expect that these criticisms will mean nothing to anyone outside the UK but for us Brits this book is about as convincing as Mary Poppins and can hardly be expected to induce any “willing suspension of disbelief”. A dog barked as she was unfolding another timetable.There was a blinding flash followed by an explosion. Merope/Eileen staggered and fell. If she hadn’t fed the dog, would it have barked? If it hadn’t barked, would that have affected the continuum and therefore made Mike lose his shoe and therefore the war? And Polly had been so sure of herself but still had got lost. Oh no! She’s going to use the conditional perfect again, isn’t she?